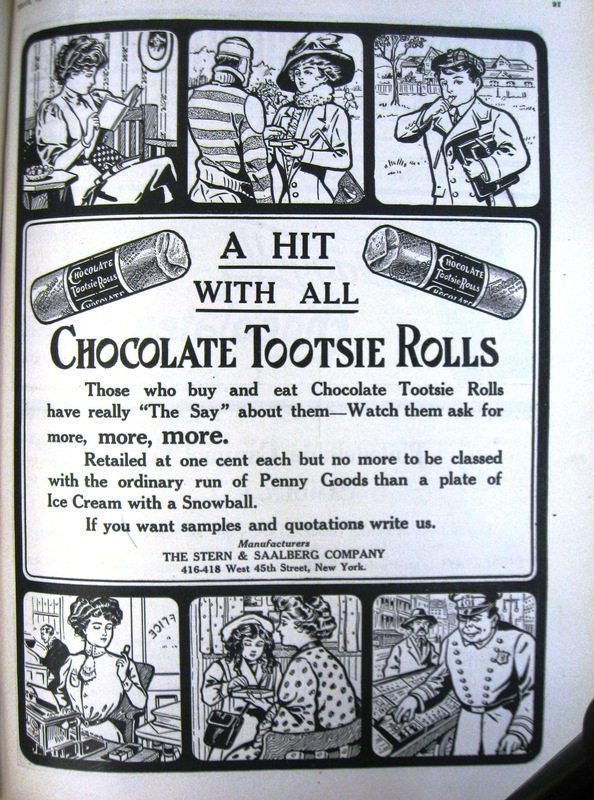 Chocolate Tootsie Rolls are “a hit with all.” And just whom do we mean by “all”? Let’s see. We have the lady at leisure with a book in one hand and a Tootsie in the other. Or for the working woman, a Tootsie chew at the typewriter. Tootsie is for the sporting types as well, as we see Lady offering a morsel to a burly line backer. At home, Mama might offer a bite to her sweet one. Look, there’s Junior, snacking on a Tootsie on his way home from school. And even Officer Nightstick enjoys his Tootsie. Men and women, young and old, leisured and working, at play, school, home or office: everybody eats Tootsie Rolls. Tootsie Rolls is up to something interesting in this ad. They are selling a piece of candy at the price of one cent: penny candy. But “penny candy” is cheap, in price and quality, and considered suitable only for children. And the penny candy market is the very bottom. If you want a big piece of the candy pie, you need to sell up. Stern & Saalberg, the makers of the Chocolate Tootsie Roll, had a couple of ideas. First was the packaging. Whether Tootsie Rolls were the first penny candy to be wrapped in paper is impossible to say. Paper wrapping machines were common by 1908, the year Tootsie Rolls were first marketed, and other candies large and small were sold wrapped. 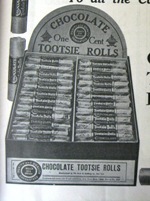 But the wrapper on the Tootsie Roll is distinctive, the shape is distinctive, and the display of all those Rolls lined up in their case is quite eye catching. And while “penny candy” was usually brightly colored to catch the child’s eye, Tootsie Roll was wrapped in more “sophisticated” tones of gold and chocolate brown. The power of syllogism also came in hand for making the Tootsie Roll stand out in the penny field. The copy on this ad reads: “Retailed at one cent each but no more to be classed with the ordinary run of Penny Goods than a Plate of Ice Cream with a Snowball.” Put on your SAT hats: Snowball is to Ice Cream as Penny Good is to Tootsie Roll. Tootsie Roll comes out way ahead in this game of logic. Of course, that didn’t mean that you were getting a special deal. As you can see in this re-design of the package in 1913, a 5 cent box gives you 5 one cent candies, and likewise for 10 cents. But you do get a nice box to go with it. Entry filed under: 1890 to WW I, Marketing, Packaging. Tags: candy wrapper, penny candy, stern and saalberg, tootsie rolls. Hershey’s Pieces, Brought To You By B-School	Where Do You Buy Candy?